Volvo’s elegant new V90 Cross Country is the real deal offering features like Hill descent control, all-wheel drive and increased ground clearance to keep you moving in the right direction. What a stylish station wagon come SUV that’s loaded with impressive technology and chassis design to get you places that are well off the beaten track. Whether on-road or off-road, you can adapt the drive to your demands with Volvo’s optional drive mode settings that feature Comfort, Eco, Dynamic, Off-Road or Individual modes. With Individual mode you can create a mode that suits your driving style. 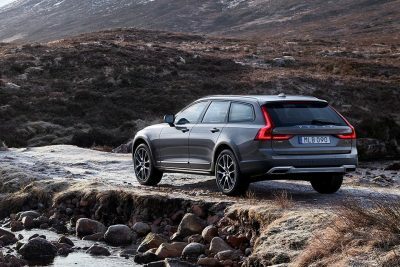 The V90 Cross Country offers very secure handling and precise steering control. Engines offered in the V90 Cross Country are familiar. A T5 and T6 version of the strong 4-cylinder petrol-fed engine are offered. You can count on the T6 being way more grunty, as the addition of the supercharger has meant that torque and power has climbed high to make it a strong performer. This is, perhaps, better matched to tougher off-road excursions with the extra power available to get you out of a steep ascent or sandy track. A diesel engine for the Volvo V90 Cross Country will also be available – it’s more a question of when it will become available in Australia. Whether Australia gets the T8 Hybrid version remains to be seen, too. Transmission details include the excellent eight-speed auto that we’ve seen in the S90 and V90 versions. Smooth, efficient power delivery for the Cross Country is guaranteed. The AWD transmission in the Cross Country has been tuned specifically for tackling off-road duties as well as standard on-road requirements, thus more torque is available to various wheels when slippage is detected on and off-road. What a perfect wagon for people who love outdoor adventure. Cross Country versions of the V90 look beefier, and these exterior looks are striking and musclier thanks to the flared plastic wheel arches and raised ride height. Wheels and tyres are wider and larger as well. The V90 Cross Country now sits on big 20-inch rims. You’ll notice that the exterior window detailing is black instead of chrome, and the grille at the front has a chequered pattern. At the rear is a bumper that has Cross Country imprinted in a chunky font, and looks kind-of cool. Having to negotiate off-road terrain also means that the beefed up suspension components make this a very solid feeling Cross Country wagon – whether on the road or off it. An air suspension system in the back keeps things very well sorted and is one item that’s appreciated when heavily laden. Volvo V90 Cross Country wagons are also ideal for towing. 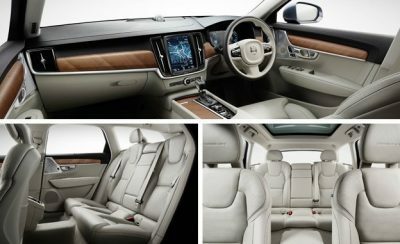 Volvo V90 Cross Country interiors are beautifully crafted and one of the nicest and most comfortable interiors to be in. As has been the case in the last couple of years, Volvos are outstanding in interior design – award winning in fact. A walnut wood interior trim is only available to the Cross Country wagon. Of course, there are other trims to choose from, too. As expected the seats are lovely, not just in appearance but also in function. Accent stitching and double stitching is used in places throughout the interior and this is a nice contrast. Audio systems in the Volvo S90, V90 and V90 Cross Country are wonderfully clear and state-of-the-art. Apple Car Play and Andriod Auto are some of the fabulous new techie gear on-board that control features like continuous music streaming, Bluetooth communications, driving modes etc. On the road, the new V90 Cross Country has been designed to ride very comfortably in a relaxed, controlled manner. This confidence inspiring chassis has the ability to cover vast distances while providing occupants exceptional comfort. On the other hand, the off-road capacity of the vehicle has been tested and pushed to be as flexible as possible. In Sweden, which has been the testing ground for the Cross Country, there is an awful lot of country that is wild and beautiful. It is the perfect place for exploring just how good an off-road vehicle is. Rest assured the new Volvo V90 Cross Country can tackle some tough terrain with confidence. Most people will never truly find the vehicle’s limits. The V90 Cross Country is definitely the best station wagon on the market that has any decent off-road capability. So, space, comfort, and AWD capabilities are taken care of, which really leaves us the question of safety. With Volvo’s dedication to providing the best safety in the world, not to mention their goal of having a vehicle that nullifies any possible fatality while driving on the road by 2020, you can rest easy in the knowledge that you are driving a vehicle with world-leading safety features. 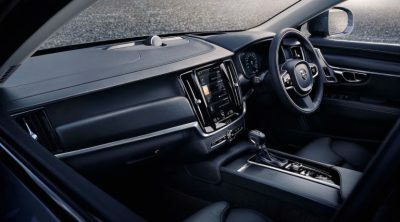 Standard safety features in the V90 Cross Country are as follows: airbags throughout, seat occupancy sensors, traction control, ABS and driveline systems, Volvo On-Call, stolen-vehicle tracking, height adjustable safety belts, seatbelt pre-tensioners front and rear, LED low/high beam headlights, fully automatic exterior light control, headlight washers, cornering lights, daytime running lights, directionally adaptive headlights, LED brake lights, door curb lights, illuminated entry, Parking assist guidance, remote keyless entry, a keyless access system, a panic alarm, rear child safety door locks, a theft-deterrent alarm system, ignition disable, lane departure, Lane Keeping Aid/Run-off Road Mitigation, a theft deterrent radio, blind spot sensors and a low tyre pressure warning system. This is clever stuff and really is just scratching the surface because we haven’t even talked about chassis strength, crush zones, steel purity and rollover detection for example. Pedestrian avoidance and intersection safety systems are other safety features you can experience in a new Volvo. I would place my bets on Volvo’s future as being a bright and successful one. Already, the popularity of the classy brand is on the increase. Volvo’s new V90 Cross Country is the current class leader. For any more information on the Volvo V90 Cross Country models or, for that matter, any other new car, contact one of our friendly consultants on 1300 303 181. If you’d like some fleet discount pricing (yes even for private buyers! ), we can submit vehicle quote requests out to our national network of Nissan dealers and come back with pricing within 24 hours. Private Fleet – car buying made easy!